The EverEarth garden collection for children, including the sweet Garden Trolley above, are sized just right for young gardeners and are made with eco-friendly materials to boot. The Garden Trolley will not only enable your child to work alongside you in the garden, but the set can also be used to encourage expansion of the imagination through role playing. The Garden Trolley is designed with a bench for when young gardeners get tired, and comes with four real-working garden tools. Two of the tools are hand tools (a trowel and short shovel) and two are long handled tools (a rake and bigger shovel) for harder garden chores. Plus, after a long day of digging in the dirt, mild soap and a damp cloth are all it takes to make these tools sparkle like new. Not only does this garden trolley get little ones involved in a sustainable activity, but the trolley is made from high quality Beech wood, 100% sourced from the company’s very own FSC forest and finished with non-toxic paints. Rigorous safety testing additionally ensures a fun and safe gardening experience for young kids. The trolley comes in fully recycled and recyclable packaging and for every EverEarth toy sold and registered on the company website, the company will plant a tree in their forest, which is currently over 20,000 acres and growing! Due to some small parts, this toy may be a choking hazard for very young children, but is suitable for tots ages 36 months +. 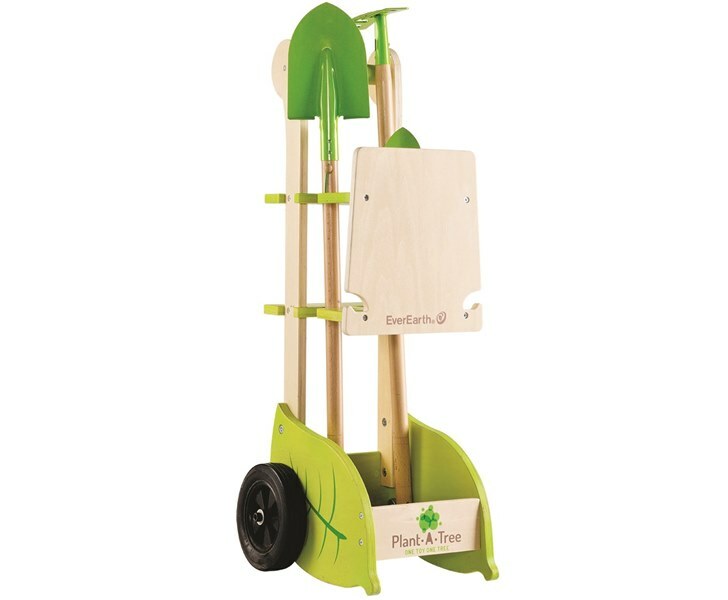 The EverEarth garden collection for children, including the sweet Garden Trolley above, are sized just right for young gardeners and are made with eco-friendly materials to boot. 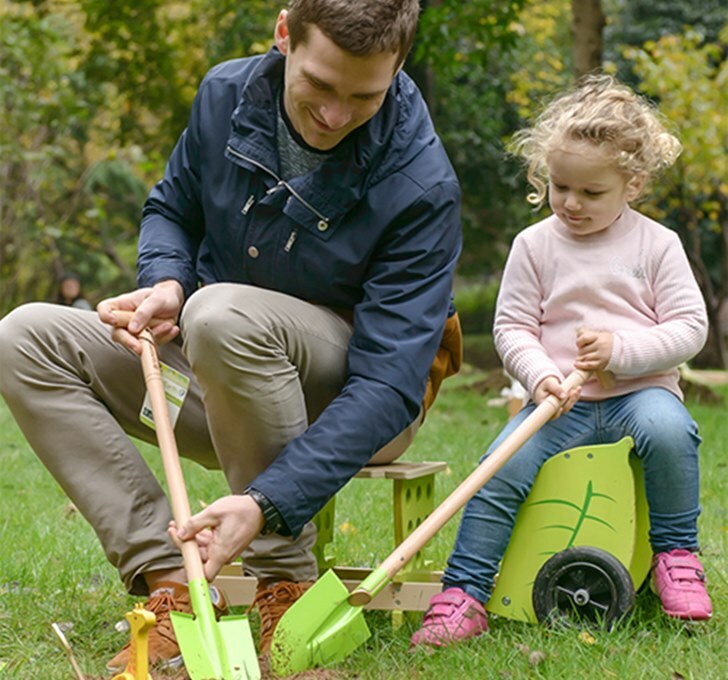 The Garden Trolley will not only enable your child to work alongside you in the garden, but the set can also be used to encourage expansion of the imagination through role playing. The Garden Trolley is designed with a bench for when young gardeners get tired, and comes with four real-working garden tools. Two of the tools are hand tools (a trowel and short shovel) and two are long handled tools (a rake and bigger shovel) for harder garden chores. Plus, after a long day of digging in the dirt,�mild soap and a damp cloth are all it takes to make these tools sparkle like new.